Mercedes-Benz have unveiled the first details of the next generation engines at a Mercedes-Benz TecDay event. These engines, no matter how impressive they may sound, are not concepts, and will make debuts in production cars in 2017. 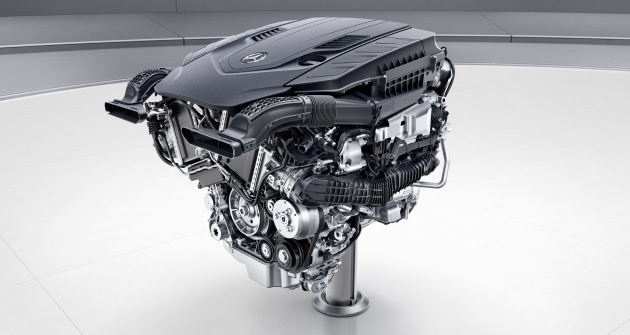 There’s love for both petrol and diesel engines from Mercedes-Benz, ranging from four-cylinder motors all the way to big V8s, although the latter does see some further shrinkage in terms of displacement. All engines are built around the 500cc per cylinder displacement concept so you have 2.0, 3.0 and 4.0 litre engines. The rumours are true – Mercedes-Benz has abandoned the V6 in favour for the inline-6 configuration. But the inline-six layout isn’t all that’s new for the 3.0 litre M256 petrol engine. The engine uses a 48V electrical system, which allows the entire ancillary system to be overhauled. For example, there is no longer any belt drive in front of the engine to power stuff like the water pump or aircond compressor – these are all electric items that are powered by the 48V system now, so they can be positioned elsewhere in the engine bay. This results in shorter installation space requirements. Since the inline-six is narrower than V6, the ancillary systems are positioned on the left and right of the engine. The engine is turbocharged but also has a 48V-powered electric auxiliary compressor (eZV, or electric turbo) to eliminate turbo lag. The starter motor has also been replaced with an Integrated Starter-Generator (ISG) installed in between the engine and the transmission that can provide a 15 kW boost to the engine. Total output for the engine can go up to over 408 horsepower and over 500 Nm, while CO2 emissions have reduced by about 15 percent compared to the outgoing V6 engine. The engine also includes a particulate filter in the exhaust system, which is something you usually see only on diesel engines. 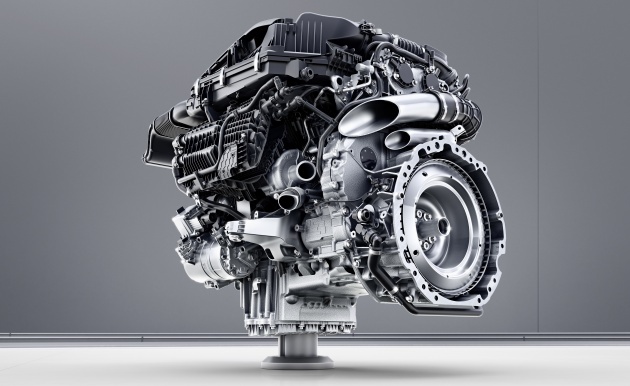 For petrol engine particulate filters, Mercedes-Benz is using cordierite, instead of silicon carbide which it uses for diesel particulate filters. 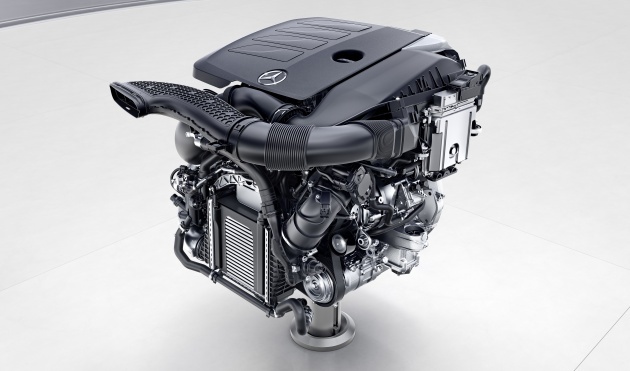 This engine will debut with the W222 S-Class facelift next year. Lovers of big diesel engines will be able to enjoy more power – the OM656 is now expected to do 313 horsepower up from 258 horsepower of the outgoing big diesel, while consumption is reduced by seven percent. The OM656 uses stepped-bowl combustion, two-stage exhaust turbocharging, and a new feature for Mercedes-Benz diesel engines – CAMTRONIC variable valve timing. As expected, Mercedes-Benz’s non-AMG V8 is now 4.0 litres, following the direction set by AMG’s new V8 engine. From its 3,982cc displacement, peak horsepower is 476 hp (up from 455 hp) with peak torque of 700 Nm kicking in from 2,000 rpm. The closed deck V8 has cylinder deactivation, which allows it to run on four cylinders during light loads and engine speeds of up to 3,250 rpm via the CAMTRONIC variable valve timing system. It uses a particulate filter as well. 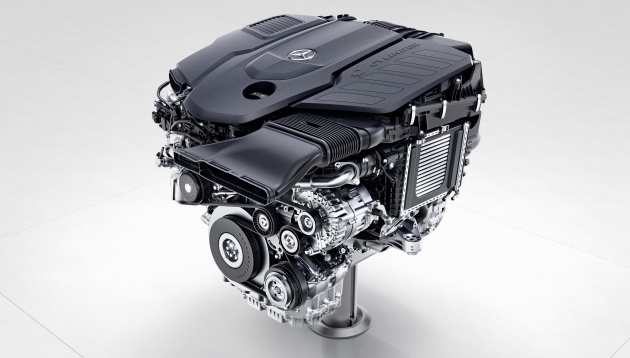 This new engine will debut in the W222 S-Class facelift. Most Malaysians will be buying 200 and 250 badged Mercedes-Benz cars, so this should be the most interesting bit to read about. Like the M256 six-pot, the new four-cylinder engine gets a 48V system. The turbochargers are now twin-scroll turbos, and there’s a particulate filter in the exhaust system. However, instead of an ISG sandwiched in the gearbox, the M264 uses a belt-driven 48V starter-alternator (BSA) mounted where the conventional alternator usually sits. Mercedes-Benz says the BSA will allow improvements to the engine’s auto idle stop/start operation, electric boost at engine speeds of up to 2,500 rpm, energy recovery up to 12.5 kW and coasting with the engine turned off. Bravo Benz ! State of the art. Wow, the V8 can deactivate from 8 to 4 cylinders when the ‘loads’ is low. This was first found in the S-600 V-12 engine. That is like having 2 V-4 engine but only use 1 when the load is light. Bravo to Merc. Now that’s what i call improvement. noob question, would the in car accessories (12v) still be compatible? Assuming you are talking about modifying the car by putting amplifiers and subwoofer or extra LED headlights, Monitors and etc.. the answer is no, 48V to 12V will cause the 12V component to overheat and possibly catch fire. Voltage doesn’t fluctuate but Wattage does. The only way around it is a add a voltage regulator so that the 48V can be converted into 12V. Now I assume your are talking about plugging it into the existing 12V receptacle, the yes there are pre-build regulators so you can charge you phone or devices on it. in the 1980s, BMW and mercedez benz were using either a stright 4 or straight six engines and never a V configuration. so welcome back Mercedez to the V-sixers!! This is quite disappointing. There was a lot of hoo-hah in August about Diamler Benz entering the electric vehicle market to challenge Tesla and there was a lot of enthusiasm about having a large carmaker enter the market as it means a speed-up in the growth of electric charging infrastructure. Now it’s October and we see Diamler Benz back to talking about petrol and diesel. Mercedes Benz used to be “the future of the automobile” but until today we have not seen or heard of a viable mass-market all-electric drivetrain from Diamler Benz. Germany’s Bundesrat (federal parliament) voted to ban internal combustion engines by 2030, so it’s very disappointing to see that there’s no large-scale move to full electrification of all land vehicles. I don’t understand what the problem is, it’s definitely not a technology problem. Tesla has released all of their patents for electric cars for public use meaning any car company no longer needs to spend money on redoing the research, they can just take Tesla’s patents for FREE and build pure-electric cars. Why is this not happening? Why is Proton wasting time with partners after partners to “research” on electric cars when the patents of the world’s best electric car have been made available for totally free? ?